I’ve got some good news for those of you who still miss Erika’s German Restaurant – there’s another place in Memphis to get your schnitzel fix. Mary’s German Restaurant is in Collierville, but it’s more than worth the drive if you’ve got a craving that can’t be denied. A warning though – it’s almost impossible to find if you’re going off of Google Maps or Mapquest. I spent a good 20 minutes driving up and down Poplar, confused and while we were eating and finally resorted to calling and asking for directions. Once I found it (it’s at the corner of Poplar and Houston Levee), I got so excited about eating that I forgot about the drive. 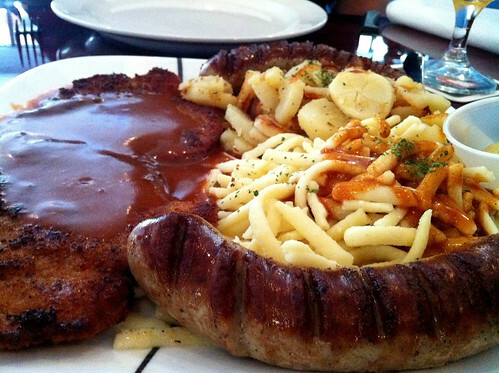 I’d never had German food before, so my dinner buddy and I decided to get the Sampler for Two ($28). It came with two bratwurst, spatzle (a sort of thick, short noodle), fried sliced potatoes and the schnitzel of our choice. We went with the Paprikaschnitzel, which was a piece of chicken that had been pounded flat, breaded and topped with a paprika sauce. The potatoes were like a cross between home fries and French fries, and the brats were perfect for dipping in spicy mustard. I recommend washing dinner down with a cold Spaten Lager – it comes in a fancy, goblet-style draught glass and goes perfectly with all of the meat. Speaking of meat, Mary’s is almost exclusively for carnivores. The only apparent vegetarian options on the menu are the Garden Salad and the cheese sticks. When I was there, the blue dining room was busy with families having dinner, but it wasn’t totally packed. The service was extremely friendly (with our waitress giving a cheerful “auf weidersehen!” to departing tables) and quick. Mary’s is open nightly from 5 p.m. – 9 p.m. on weeknights and from 5 p.m. – 10 p.m. on weekends. thanks for the comments you left us. I hope we will see you soon again. Hope it's alright that we linked your article on our website! Just a heads up about Mary's. I called about their dinner hours and was told to be there by 8:15pm even though their posted hours said 9pm. I drove from midtown to collierville and was turned away at 8pm because the kitchen was closed. I won't be going back. Mary was pretty rude about the whole thing.